Mention Vietnamese cuisine and my immediate association would be a steaming bowl of pho. 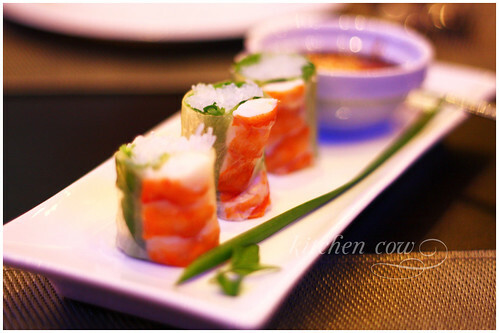 That’s why dining at Aquaknox proved to be a very interesting eye-opener to the world of Vietnamese cuisine—beyond pho. 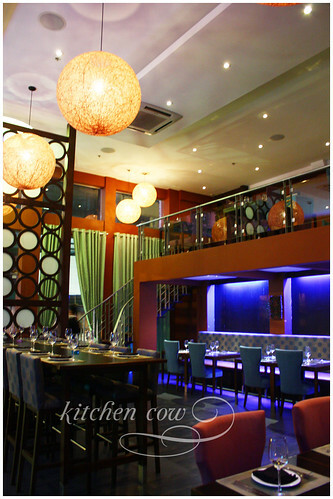 Aquaknox Restaurant’s cuisine is best described as contemporary Vietnamese. Departing from the traditional, chef Danny Vu gives the dishes his signature style, honed at various celebrity restaurants in San Francisco, Las Vegas and Beverly Hills, for dishes that are sure to tantalize and refresh local palates. 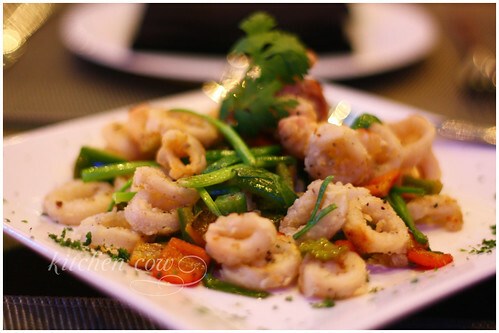 Our dinner started off with the Hai Phong Wok Calamari—an appetizer with crispy squid rings tossed with bell peppers. Almost classic bar chow really, though the usual tartar sauce was replaced with bell peppers. Still, this was well executed, with the squid cooked just until tender, coated with a crisp batter that stayed crisp. Together with the calamari, we were served two kinds of spring rolls. 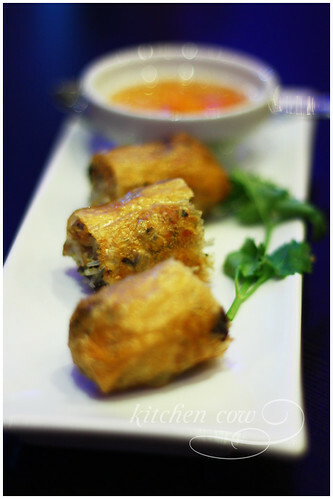 The first one was a fresh spring roll, Goi Tom Cuon Prawn Spring Rolls. It featured a generous serving of plump prawn, glass noodles and lettuce in rice paper. A sprig of cilantro tucked in the roll gave it an added kick. Try it with the peanut sauce for a richer flavor, or plain for a fresher feel. It’s really yummy either way. This was my favorite among the three appetizers we tried. The other spring roll was the Cha Gio Crispy Rolls. This one was stuffed with crab, pork and rice noodles. It’s served with a spicy dipping sauce that’s a nice complement to the rich, savory pork and crab. After the appetizers, they brought out Natasha’s King Prawns with Mangoes, named after one of the restaurant’s partners, Ms. Natasha Morse. Mesclun with ripe mangoes and crispy battered shrimp, drizzled with a mango vinaigrette, this was easily my favorite for the evening. The mangoes they used were so sweet, adding a fleshy, sweet bite to the fresh lettuce. 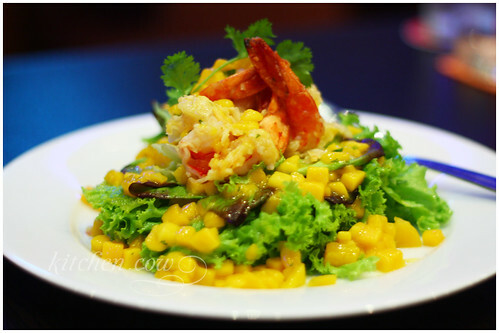 Complemented by the tangy-sweet vinaigrette and the large, plump and oh so crispy shrimps, this salad can win over even non-salad eaters. This entry was posted in restos & eateries, sponsored events and features and tagged aquaknox, arnaiz, contemporary, crab, danny vu, makati, manila, pasay road, restaurant, thahn long crab, vietnamese. Bookmark the permalink. Nice shots! And I’m mouthwatered to death now. Heehee. i love spring rolls and your photo is awesome! Well, not fastfood cheap but reasonably priced for what you get. Methinks 500 per head or less? Their webby has prices listed, you may want to check it out if you’re curious. It’s actually more competitive than the other restaurants at par with aquaknox, our average price per entree would be at PHP 380, servings are grand and worth all the flavors and goodness you can get! please visit http://www.aquaknox.com.ph for our complete profile, thanks!